Located out past Frederick's Peak, Wild Horse Mountain is not very well known. It's name may be it's best feature as the summit does not have much to offer. 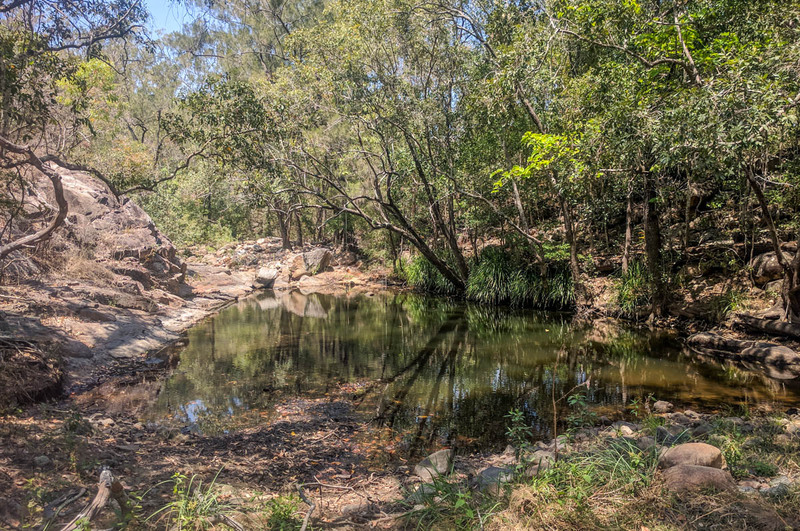 In my opinion, there's not much to see and no geocache; but if you're anything like me, you're going to want to do everything possible around Townsville. I would only suggest attempting this hike after a burn off as it is thick and scrubby with intertwined vegetation towering over your head. Or another good option is to drive to the base of the mountain which will cut the walk short. You will be bushwalking through Tall Guinea Grass, Lantana, Devil's fig (Solanaceae) with hidden rocks and fallen trees hidden under the long grass. Drive out Harvey's Range Road past the dump. Take Granitevale Rd on the left, before Rupertswood and drive until you meet the gate. Take a left down the four-wheel drive track and park you car off the track as it starts to head away from the fence line - just be sure that your car's turbo isn't in contact with long dry grass as you don't want to start a bush fire. Alternatively you can contact the land owner and request permission to drive through their lands to the base of Wild Horse Mountain; however, I do not have their contact details. From the car park, walk around the property (Fred's peak side) and down into Stoney Creek. Continue along the creek bed until it gets to scrubby then head up toward the ridgeline and follow that along to the summit. There are a few nice views of the mountains from small rocky outcrops along the way. Stoney Creek may provide a few pockets of stale water but for the rest of the trip, there is no water sources. I recommend carrying 3 liters of water and a few snacks. This walk should only take you three quarters of a day (return) mainly due to the thick scrub. Watch out for the fallen trees and hidden rocks under the long grass. And as always, take a map & compass or GPS - phone GPSs work well out here. Please also consider taking a PLB. Here's the two recommend routes to the summit. Out the back of the Ross River dam is Round Mountain. It's almost a part of the Frederick's Peak mountain range. From the Townsville side, if you look at the mountain with a creative mind, you can see a woman laying down facing upwards. The summit is her forehead and the lower peak is her nose.